It’s that lovey-dovey time of the year again… when display windows are plastered with paper hearts and single people feel like they are doing something wrong. Yeah… I may not be the most romantic person… but I do love my TV couples! He is an ex-con impersonating a cop, she is the daughter of an Ukrainian gangster impersonating a housewife… and I think they are absolutely perfect for each other. Probably no-one would describe Banshee as a love story… but it sort of is. If you look past all the Native American, Amish and Ukrainian violence; what moves the story is the relationship between Ana and Hood. Lucas came to Banshee looking for Ana and now he is staying there to protect her [and their daughter]. A lot has happened between them [including Ana almost handing him off to her father only to rescue him later] and it seems like there is no way out… but that is what makes it interesting. I believe, without a doubt, that they love each other and their connection feels so real. Nothing about them is forced or overstated, it just is. Probably a lot of people need to die before they can be together, but I can’t wait to see it happen! I like Neal OK? I may still think of him as a fang-banger assassin from time to time [that was a True Blood reference, in case you missed it], but I like him. Having said that… how could you not like Hook? I bless the writer that came up with the idea of not casting an old man with a perm and getting dreamy Colin O’Donoghue instead. The character was in essence one of the “baddies”, so I was a little surprised when they started teasing a relationship with the self-righteous leading lady. But that’s one of the things I love about this show: characters are not black and white. So yeah, Hook is “morally ambiguous” to say the least, but he has charm for days and a lot of redeeming qualities [and I am not talking just about his pretty eyes, he does have his heroic moments]. And don’t tell me you didn’t totally swoon when he said that line about winning Emma’s heart. 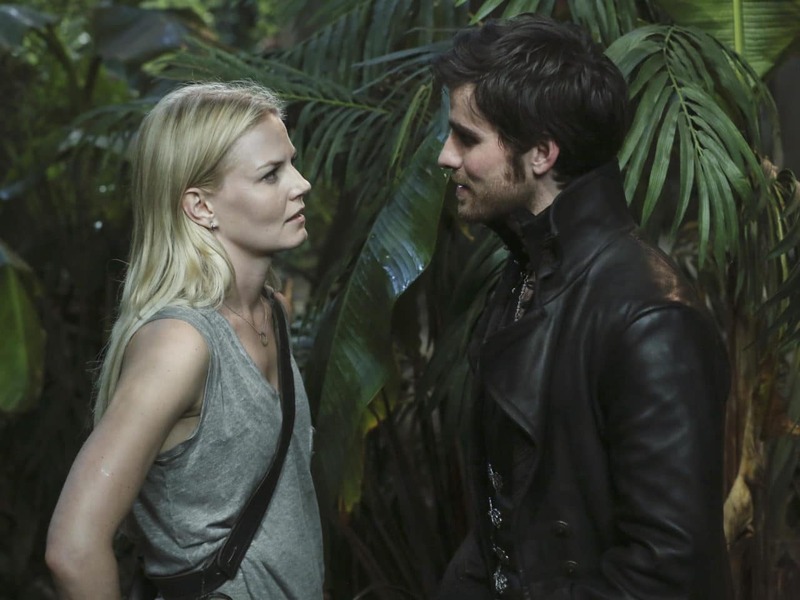 The pirate and the saviour… probably won’t end well, but I still want to see it happen! If not… I am sure Hook can find plenty of women willing to comfort him. She is a clone pretending to be another clone and he is a spy pretending to be in love with a different clone but that truly falls for this other clone… That was hard to sum up in a sentence… Anyway, Orphan Black, is definitely one of my new TV obsessions. The show, which revolves around human cloning, is exactly the type of sci-fi I love [unlike Helix, which I am still very iffy about]. The lead actress, Tatiana Maslany, is SO GOOD she has me convinced she is 9 different people. Here is the unexpected love story in a nutshell: Sarah (a British orphan punk) steals Beth’s identity (an upper class cop) after she witnesses her suicide. Sarah tricks Beth’s boyfriend, Paul, into believing she is Beth. 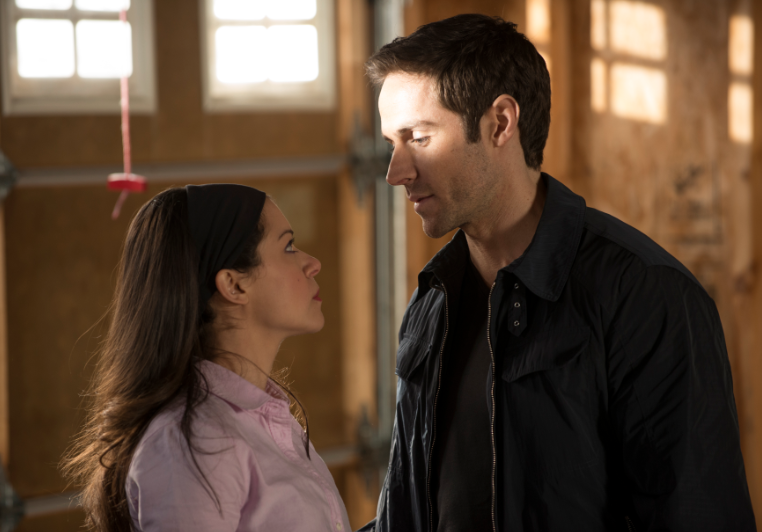 At first we feel bad for Paul until we discover he was actually spying on Beth… so we start not liking Paul until we discover he was being blackmailed and he is actually a good[?] guy [and very easy on the eyes]. In the middle of all this, we discover that Paul never had feelings for Beth [which is sad] but quickly develops feelings for Sarah [which I thought was sort of interesting]. I think what I like most about this pair is not the actual “couple” but how my expectations/feelings about them were constantly changing. It felt very fresh and original, as everything else on this show. Now… I don’t fully trust Paul… We’ll just have to wait and see what happens in S2… but in the meantime, I am totally into the clone and the clone spy love affair. She is a prostitute; he is the member of one of the most powerful families… It’s just like the plot of Pretty Woman… OK, maybe not. And I know, I know… not the most traditional couple to ship… but I do! It’s Game of Thrones, what do you expect? I would never go as far as shipping Cersei /Jaime, but Game of Thrones has made me root for some really weird pairings like… Brienne/Jaime [I know…], Daenerys/Drogo [totally loved them, this one is not so weird right? ], Daenerys/Jorah for a while, Sansa/The Hound [I said this was weird!] So… in the grand scheme of things… Tyrion and Shae are not such an odd couple to ship. Tyrion is my favourite character of the show and I actually really like Shae. Played by the lovely German actress Sibel Kekilli, her character on the show is so much more interesting than in the books [which is something I would rarely say]. I think, in the middle of so much deception and falsehood, their relationship is honest. Last season, when Shae throws the money back to Varys and refuses to leave… I thought it was the most romantic gesture. Plus, both are probably going to die [DO NOT tell me, I am SPOILER FREE - I actually just spoiled myself and OMG that's... tragic, but I am going to pretend I don't know how it ends for now]… so they perfectly fit in with my “doomed and torture” theme. To further complicate things, Alana is a former student of one Dr. Hannibal Lecter and Will’s colleague at Quantico. And… you know… there is the fact that by the end of the season Will is imprisoned for the crimes Hannibal committed. Yep… they sure are tortured... Will she believe in Will’s innocence? Will she be able to clear Will’s name? Will Hannibal eat her before any of this happens? So much to look forward to! Honourable mentions: Other doomed couples I loved this year were Mary and John Watson on Sherlock and Emily and Aiden [Daniel and Jack who?] on Revenge. So, what happened to last year’s tortured souls? Well… the bad thing about shipping doomed couples is that they end in tragedy far too often! Sybil & Branson and Tara & Jax are couples no more… Both girls tragically died on childbirth/death by mother-in-law-with-ice-pick respectively. R.I.P. Sybil and Tara. Two other romances I loved slowly died [even though the characters are still alive]. I am talking about Christina & Owen from Grey’s Anatomy who unfortunately broke up. Prince Charming & Snow are still very much together, but they’ve just become so boring… so many other better couples to care about on Once Upon a Time. Ava & Boyd were still going strong, but I am behind on Justified! So I might be wrong. Won’t comment more until I catch up [don’t spoil me!]. Finally Vincent & Catherine from Beauty and the Beast… well on the positive side, unlike other couples on this list I don’t think either is going to die and I am 100% sure they will end up together [it says so in the title!]. It is so hard to believe that this time last year V & C hadn’t even kissed! Since then, they got together, had some of the best romantic moments in TV history. He was taken, experimented, came back a changed man, they got back together, they broke up, a plastic doll with red hair came into the mix [what? That was a real person? You can understand my confusion], the doll died [she even died wrong IMO], now the dashing ADA [potential Beast] is in the mix … etc etc… Hey, we knew they weren’t going to have it easy! I am actually really looking forward to what will come next and I am glad they are working their way back to what they used to be. I’d rather suffer for a couple more eps than to have things that feel “forced”. And that’s it. Thoughts? Other couples you love that I forgot? Love to hear it. In ep Till Death of Beauty and the Beast I could not help thinking about their Valentine´s day in season 1. Vincent tried so hard to woo Catherine. And succeeded at the end. In season 2 he lets her go to Gabe - out of love for her he sais. I agree with you that they will eventually come together again. I´ll follow that bumpy road. Re BATB: PLEASE SOMEONE TELL THE WRITERS TO MAKE THIS SEASON A DREAM OF CAT'S (SEASON 2 FINALE FINAL SCENE). I'm not saying I don't want this show renewed or I have disliked everything about season 2. I just would prefer for season 2 to be a dream bc of the stuff I wish hadn't happened happened. Most liked season 1 so could the writers please just make this season a dream that Cat waked up from in the s2 finale as she turns to see Vincent with a scar on his face next to her in bed. I realize this is a cop out to some extent, but I just want happy memories lol so I don't care! This would be a way to undo the s2 stuff I didn't like (by making it not having happened bc it's a dream). LOL Someone tell the writers to do this asap! I realize some have liked s2, but they can just do the stuff you liked in s2 in s3 if there is one and do it better and if there isn't a s3 then we are just left with the memory of s1, which most fans could agree they liked. Note to self: only watch shows once they have ended and are on Netflix so you don't get anxious about their storylines bc then you can just binge watch them, not get attached, and get over them. I wish I cared about this show less...LOL I truly do still think the dream thing could be a good twist. I just doubt they'll do it, which bums me out.